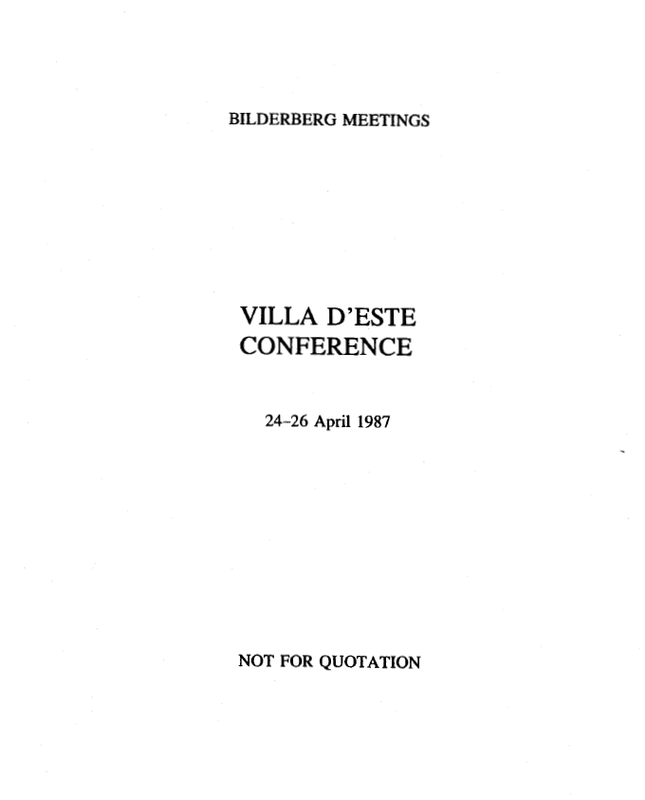 The thirty-fifth Bilderberg Meeting was held at the Grand Hotel Villa d’Este, in Cernobbio, Italy on April 24, 25, and 26, 1987. There were 106 participants from 19 European countries, the United States, and Canada. They represented government, diplomacy, politics, business, law, labor, education, journalism, the military, and institutes specializing in national and international studies. All participants spoke in a personal capacity, without committing in any way the governments or organizations to which they belonged. As is usual at Bilderberg Meetings, in order to permit frank and open discussion, no reporting of the conference proceedings took place. In opening the conference, Lord Roll of Ipsden, the Chairman of the Bilderberg Meetings, welcomed the participants. He then reviewed the conference program and procedures. Finally, he took note of the death of Jack Heinz, a founding member of Bilderberg and one of its most loyal and effective supporters.